The Krone-Hite 6620 provides precision phase measurements with a typical accuracy of 0.02° and a resolution of 0.01° over most of the frequency range. It will accept a wide range of input signal levels from 10mVrms to 320V rms and input waveforms including sine, triangle, square and pulses. A 5 digit LED display provides continuous direct readout of phase angles between 0.00° and 360.00° or ±180°. These two ranges can be manually or automatically selected. The 6620 employs a technique that eliminates phase reading errors usually associated with component drift called Automatic Meter Correct (AMC). AMC provides instant correction of phase readings for zero and full scale errors, making phase measurements more accurate and reliable. 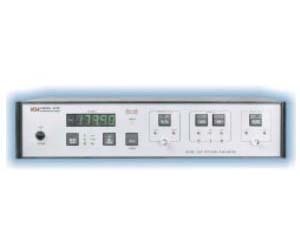 The Model 6620 provides a RELATIVE phase measurement mode which allows the monitoring of phase deviations without having to make unwanted calculations. Also provided are an automatic selection of input voltage range, front panel indicators to indicate a too low/high input voltage range, and an analog output for use with an external meter or strip chart recorder. Part No. RK-316 permits the installation of the Model 6620 into a standard 19" rack spacing.